Excels in working with cross-functional teams to launch websites, marketing campaigns, and events across the globe. Project manager and content owner for a responsive website redesign for the U.Va. 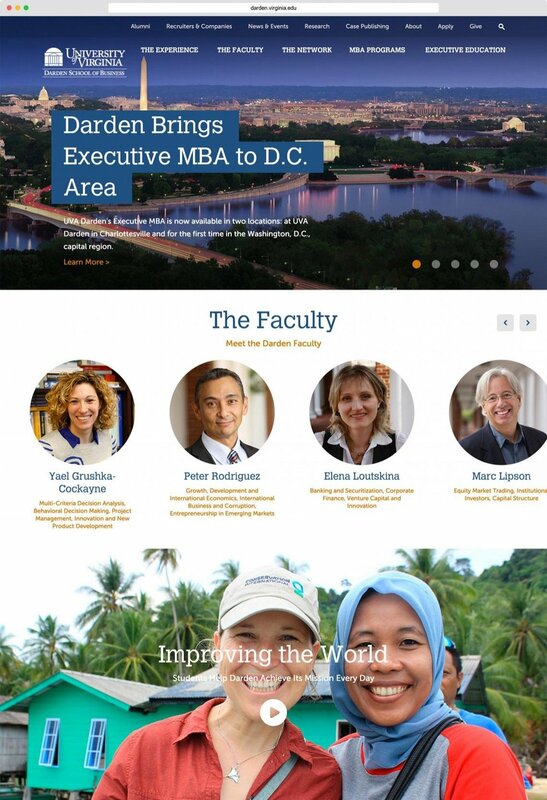 Darden School of Business. Primary role consisted of managing vendor and stakeholder relations throughout discovery and design phases. Managed discovery and design timeline; facilitated meetings with and consolidated feedback from over 20 stakeholders from different departments, including senior leadership; and oversaw copywriting and UX testing in the MBA section of the website (over 750 webpages). Also project managed website redesigns for 2012 Nobel Laureate Lars Peter Hansen and the Grant Park Music Festival. Planned a launch party for 150 attendees at Bridge 420 in Chicago. The event featured a silent auction, raffle, DJ, film screening, complimentary massages and makeover stations, hors d'oeuvres, and open bar. All proceeds were donated to the Chicago Women's Health Center. View event photos. Planned a Star Wars-themed costume party in Chicago's Millennium Park in conjunction with the Grant Park Music Festival's John Williams Tribute concert. Over 17,000 in total attendance. The costume party included a photo opportunity at Cloud Gate and a trivia contest for children. View event photos. Planned a concert and dialogue surrounding the topic of minority visibility in classical music for 50 attendees at Hairpin Arts Center in Chicago. This concert will featured music written by minority composers, performed by predominantly minority musicians as an engagement to open up dialogue for what classically trained musicians can do to become more involved in their communities. Co-sponsored by Classical Revolution Chicago and the Hairpins Arts Center. Read article on Cacophony Magazine. Served as the Planning Chair of a regional awards banquet and fundraiser for the American Advertising Federation of Hampton Roads. Approximately 100 in attendance, the event was held at a Virginia Beach restaurant and featured an art gallery, awards ceremony, hors d'oeuvres, and cash bar. View event photos.